This is for all you fishheads out there. A mix of mushrooms stand in for the clams to create a super satisfying chewiness, while some chopped up nori give this chowder a true taste of the sea. It’s thick and creamy and loaded with the finer things, like potatoes and carrots. Crumble some saltines over the top and you’ll be able to hear the Atlantic ocean lapping at your feet. For authenticity, make sure to serve this while talking like a character from a Stephen King movie. Hope you love the video! Please read more about “Make It Vegan”, my new video series! ~How fishy do you like it? Nori is pretty mild as far as seaweeds go, but the potency varies depending on the brand, and how fresh the nori is. Start with one sheet, then taste after everything is added at the end. If you think it needs more sea, you can still add another chopped up sheet. Just mix it in and let the flavor meld, off the heat, for about 10 miuntes. ~If your nori is really fresh, you don’t even have to chop it (as evidenced in the video), simply crumble it right into the pot. ~To efficiently chop nori, it works to chiffonade it. That means roll up and slice! So tightly roll up your nori sheet like a cigar, and thinly slice. Then run your knife over the curled up bunches to get them into even smaller pieces. ~If you’d like it even more chewy and you have a million dollars to spend on fungi, then go ahead and replace all of the white mushrooms with shiitake. Preheat a 4 quart pot over medium heat. Saute onion and carrots in the olive oil with a pinch of salt, for about 10 minutes, until carrots are softened. In the meantime, we’ll make the cashew cream. Drain the cashews and add them to the blender along with the vegetable broth and cornstarch. Blend like crazy, until smooth. This can take anywhere from one to five minutes depending on your machine. Scrape down the sides with a rubber spatula every now and again to make sure you get everything. Back to the soup. Add mushrooms and celery. Cook briefly, for about 3 minutes, just until mushrooms are softened. You want them to keep their texture. Add the potatoes, salt, pepper, nori and vegetable broth. Cover and bring to a boil. Once boiling reduce heat to a simmer. Cook for 10 to 15 minutes, or until potatoes are tender. Be careful to keep a close eye so as not to overcook them or they will turn into mush. Stir in the cashew cream mixture, and gently heat, uncovered, for about 7 minutes, until nicely thickened. Add the tomato paste and lemon juice and taste for salt and seasoning. Add a little extra water if it seems too thick. Serve garnished with parsley or chives, if you like, and a few saltine crackers. A wedge of lemon looks pretty, too. I love the video. We have a nut allergy in our house. I was thinking about using coconut milk for cream, but wondering about the proportions. Can you help me out? Is the goal 2 cups of cream? Thanks! Can’t wait to try. I’ve made another version with Oyster Mushrooms and it was delish. if i didn’t already love you, that kelley deal song would have made it so. great video! I watched this to hear you talk like Ben Affleck. 🙁 C’mon whatcha doin’ heah? You could also add kombu to flavor the base and then remove for serving. I am allergic to mushrooms. Is there anything you can recommend as a replacement? Love it. The video that is. It is perfect soup weather, so I am souper (heh) excited to try it this weekend. Made this tonight and it is amazing! I use arrowroot pink place of cornstarch as a rule, and loved the way it thickened up. We had our first snow today here at 7,000 ft., so this was great welcome to Winter comfort food. This is wicked delicious! I didn’t change a single thing and it brought back happy memories. Thanks. this is SO YUMMY! best chowder i’ve ever had! had to resist a third bowl. allergic to cashews so substituted blanched peeled almonds and it was great. also great b/c gluten issued household so it was perfect, going to make this a lot this winter! thanks Isa!!!! Made this tonight…it was awesome! Didn’t make any changes, and I was amazed that it actually tasted just like I remember clam chowder tasting! The texture was right on as well, think and creamy. I don’t know how you did it, but if I had had it at a restaurant, I would have double checked with the chef that it wasn’t actually clams and cream. Sounds delish. Is this recipe in any of your cookbooks? This is so very good. We’re enjoying it very much here, best chowdah evah! Thank you for the delicious chowdah recipe!! I just made it, and it’s *fantastic! * The extra sheet of nori made it awesome! I also used some dried mushrooms, because they’re chewier in soups. Wow, what an awesome recipe! We followed it exactly, and subbed shitaake mushrooms for white. The flavor was complex and fantastic, and it came together quickly. Thanks, Isa! This is so so good! I wanted more of the seaweed flavor, so I added some dulse which was awesome. Ok! Officially… I have made the chowda… um… first off YUM… i mean YUMMMMM… second off… instead of tomato paste, I threw in the 1/3 – 1/2 c of white wine that I had left over from a get-together, last night. I also added dried tarragon (fresh would have taken it to a whole other place), AND garnished with a shot of truffle oil. Oh…. I’m in deep, deep trouble. Thank you so much Isa!!! I’m so pumped about the videos. You’re ridiculous. That three minutes beats anything I’ve ever seen on foodnetwork. We made this two days ago and loved it. So of course when we made again the next night we doubled it. It is fabulous, easy, and definitely our new favorite soup. I just made this (I used all baby Bellas.) It came out amazing. Can you freeze this? How long does it keep in a container after making it? It’s such a large amount of soup, I don’t know how I’ll get through it before it goes ‘bad’…. This looks great – but I dislike seafood tastes (I know, right? What am I doing even reading this recipe?) – if I leave out the nori, will this still be tasty? I love mushrooms so much, and I would love to have a hot, creamy soup for the colder weather. What do you guys think? Yeah, it’ll be yummy. Like a cream of mushroom potato soup! I am eating this right now. I’m not exaggerating when I say this is hand’s down the best homemade soup I have ever had. The thickness is perfect and it’s so creamy and comforting. Thank you Isa, this will be in regular rotation all fall/winter. Delicious. I accidentally added the cashew broth mixture too soon but it still came out amazing. Thanks so much and great video. Hi – sorry for the random question but many recipes call for fresh lemon so I try to keep fresh lemons on-hand but they go bad before I use them. Any good tips for keeping lemons from going bad? Thanks! Well, lemon juice is fine! As long as it’s not from concentrate. Just check the bottle. I just made the soup and it is so good! I am waiting for my family to get home to eat it and I literally had to leave the room so I would stop sneaking tastes of it. Can’t wait to make the glam chowdah. 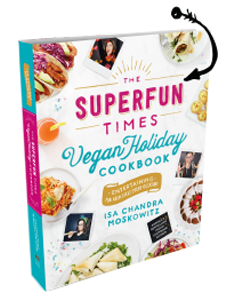 After watching the videos when you first posted them, my 8yo vegan first begged me to buy the cookbook and then to get cooking. This was my dh’s first request and it was fantastic! My mushroom hating children loved it. I thought it was all of the things I liked about the omni version without the thing that I hated (the clams). Yum, yum, yum! This soup! I’ve never had real clam chowder before and always thought it was pretty gross. I like mushrooms ok, but only in small quantities, and definitely never as the main attraction, especially not in a soup when their true texture is the point of them. I made this mostly for my husband, but turns out it’s one of the best soups I’ve ever had, and I guess I love clam chowder. Well, glam chowder. It’s magic! And crazy delicious. Oh wow. I don’t know what possessed me to make this. I’m from Australia and had never heard of clam chowder. I’ve never had chowder OR clams, let alone both together. I had no idea what to expect so I followed the recipe absolutely to a T – no crazy substitutions or modifications. And my god it’s delicious. I had all the ingredients bar the mushrooms so it was cheap as chips to make, and it’s so incredibly luxurious for basically a pantry-staple recipe. Amazinggggg. Also! I had to come back to add that my husband, my meat eating, seafood loving, adores new england clam chowder husband, said that this is the best chowder he’s ever had. Including over the place we got to in cape cod every year on vacation, which previously held the spot of his favorite clam chowder. He said the thing he sometimes dislikes about clam chowder is when it gets too overly fatty tasting, and this one eliminated that problem and was just amazing and delicious. Win! You are a mad genius. I’m an omnivore who doesn’t cook meat and doesn’t love dairy so this was great for me, but it absolutely made my 10-year vegetarian boyfriend’s day. He used to love clam chowder in the fall and he was just beside himself with cracker-crumbling happiness at dinner last night. Definitely a repeater, next time with jackfruit crabcakes! Applause! The whole family loved this – including two teenagers (“This hits the spot!” “It’s a keeper!”) and a 12-year-old who doesn’t like mushrooms (empty bowl, no comment). Well sorta this soup. Alas no nori, so I just did it up as a potato soup. Cashew cream is my new secret soup weapon. Hurrah! Made this but used kombu broth and added Bragg’s kelp seasoning blend cause I love me some fishy flavour. So, so good. And a great fake for seafood chowder. Very satisfying. I’m German andI never had a “proper” New England clam chowder. Just made this tonight and this stuff is freakin’ awesome. The cashew cream is just genius. LOVE LOVE LOVE it! Plus the videos are simply DA BOMB. If you are allergic to mushrooms (such as myself), I made this chowder with pressed, frozen, tofu (that I baked for 20 min in a 400 degree oven). It added that lovely, chewy texture for the clams. I thought the soup was amazingly good. However, I found the liquid proportions to be a bit off. I added an extra cup of broth, and might even add 2 extra cups the next time I make this recipe. The broth quantity as in the recipe would barely cover my veggies (I followed everything exactly). I need to reiterate, THIS SOUP IS AMAZINGLY DELICIOUS. Well, mushrooms release moisture and tofu absorbs it, so that could account for some of the moisture issues. Love these new videos Isa!! Mmm… Now I want chowder! Oh my goodness oh my goodness oh my goodness this is table-flippin’ good! Just finished making and am eating this now. Wow, really good. I under cooked the potatoes b/c I was afraid of making mooshy potatoes. I’ll probably make it again this weekend though to fix my mistake! Thanks for yet another delicous meal. This is really “wicked awesome” soup. Never would have thought to use the nori. Thanks so much for your recipes. What size nori sheets do you use? I see them in a variety of sizes, but mine are pretty tiny. Thus, I really have a hard time getting my flavor right and tend to go a bit overboard to make up for their size. I thought your Mushroom Hot Pot was my all-time favorite soup, but now I’m not so sure! This chowder is fabulous! just made this and I love it ! Do you have the calorie or nutritional analysis? By my calculation it was about 8 c at about 270 cal/cup. I’ve just now finished making this great chowder recipe and it is going straight into my Tried, Tested, and True Vegan Recipes binder where many try out but few are chosen. I wonder if you find it annoying when commenters say things like…” I followed the recipe exactly except for the following changes” – sure hope not!. I enjoyed homemade creamy Boston Clam Chowder as a non-vegan but as I perused the recipe above I knew the chewiness of the clam was missing so I soaked some dried shitakes, drained and diced them and added them to the pot. Worked well for what I was looking for. It was a really good soup, but it didn’t really remind me much of clam chowder. Maybe that’s just because the only clam chowder I ever tasted was out of a Campbell’s or Progresso can though. I think I would put in less lemon if I were to make it again. Tasted delicious with thick bread. Definitely a good cold weather soup. Also, that lemon trick is one of the best things that has ever happened to me in the kitchen. Up until now, whenever a recipe called for lemon I was cutting them in half and squeezing them out with one of those manual lemon juicers and then measuring out the juice. Huge pain in the a$$. Now I just need to figure out the juice measurements without actually measuring. You made it look super easy, so I was all “Hey, I can just squeeze juice from the slice right into the pot too!” And then I ended up with a little too much lemon. Alas. I made this tonight for my boyfriend and his mom. The first time I’ve ever cooked for her — kinda daunting. A LOT of chopping and prepping but soooo worth it and exactly like how I remember clam chowder is! They LOVED it. Thanks so much for the awesome recipe, Isa! Love the video too, congrats on the Breville sponsorship. Hot Glam Damn! I am so happy that we bought your new cookbook. 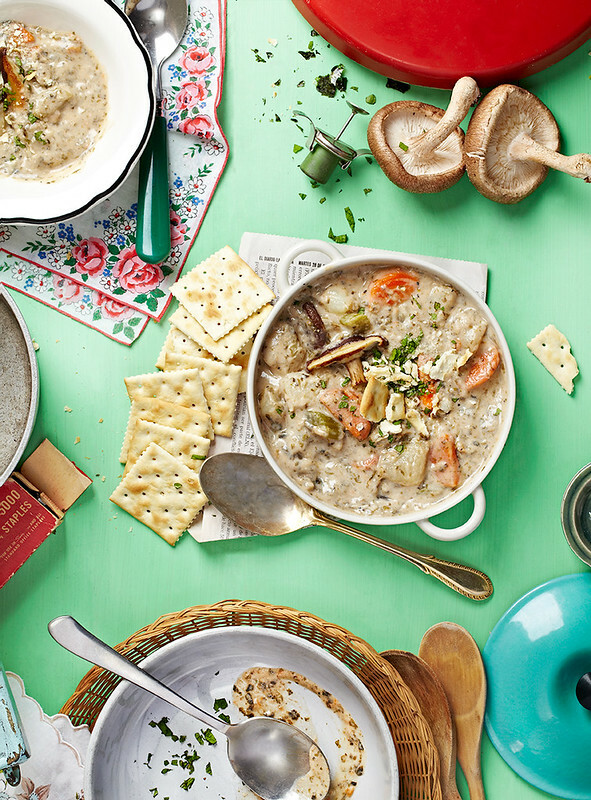 We just made this chowder tonight and it was freakin’ awesome! Thank you! Sub suggestions for cashew allergy? what other nut might work? This was awesome. Cashews and nori are miracle workers. This recipe was so easy and SO delicious: creamy, flavorful, and without the bits of sand! This one is definitely a keeper. (And Trader Joes often carries shiitakes for a very reasonable price…. We dined like mushroom millionaires tonight). Made this for dinner tonight. It is incredible. Thank you for the recipe. Here on the other side of the ocean it’s really fall with storms and all. Made this last weekend, it was brilliant, loved it. Just bought Appetite for Reduction and cannot wait to try your other recipes. Anyone have any suggestions as to what to have with this? I am making it next week and need something to go with it. Thanks! I used oyster mushrooms. It was like I really was eating dead mollusks, and I mean that in a good way. This recipe is just fantastic. Wow! I’m from originally from Maine & know my chowdah, your chowdah is “wicked awesome”. Good idea about the saltines, although I’m a Celiac, my hubby will enjoy the familiarity of crushing some saltines over his chowdah. Post Punk Kitchen is my site of choice for vegan recipes, you rock! Made this last week, using 1.5 nori sheets. Delicious! Thanks for posting it! Wow! This is delicious! I used to love clam chowder and this soup is an amazing version – the creaminess, the richness, the sea-flavor. I didn’t have the tomato paste or lemon but the soup was still so great. And the best thing is that my 3-year-old is asking for seconds. Wonderful recipe – thank you!! This is simply wonderful. As a lactose intolerant vegetarian who grew up in New England, I have missed clam chowder for the last 10 years. Eating this brought me back to when I was a kid. What type of blender or food processes would you recommend getting? Would it work use a crockpot on low for a few hours instead (I’m guessing at the stage where you add potatoes, salt, pepper, broth)? Or would that make the potatoes too mushy? It’d be great to throw together in the morning and have ready in the evening. Thanks! This is AMAZING; we just made it tonight and it was wonderful, keep up the (as always) great work! This is simply amazing!! It smells JUST like clam chowder! I didn’t really think the nori I would give it that seafood flavor/aroma, but it worked like magic. I added more mushrooms since I got carried away at the store, and also added a few glugs of Tapatio. Other than that, I didn’t stray from the recipe. I made this Friday and have been eating it all weekend… sooo good! Love, love LOVE your gorgeous new cookbook! I made it last night……. You are my new favorite vegan cook!! Great demo video, love your sense of humor! This recipe was totally amazing! It is perfect to warm you up on a winter night and a great meal that sticks to your bones. Mmmmm!!! I also agree that it would be best made with all shiitake mushrooms!! I made this about an hour ago and gave a bowl to my roommate (not a vegan) and she said “you know this kind of tastes like clam chowder.” Mission accomplished. This is truly gorgeous, thank you! I have never tasted clam chowder, although I know what it is from TV shows. I’ve eaten this many times now, it’s kind of addictive also it freezes well. Some omnis tried it and they said it tasted delicious ( and not just ‘nice for vegan food’) They also loved the Green Goddess dressing you created. Congratulations on another great recipe! This was pretty good! I used 1/2 the corn starch and dulse flakes in lieu of nori. Served with some fresh homemade teff bread. Nice meal for a cool fall night! I made this today and it is delicious. I accidentally bought way too many mushrooms but I used them all anyway. My nori was pretty old, so even 2 sheets didn’t add a lot of seaweedy flavor. I’m thinking I’ll add some kelp granules to the leftovers. Yum yum yum! I made this last night and nearly cried when I first tasted it. So freakin’ good I can’t believe it!!! Holy moly. I can’t even believe how much this is just like clam chowder. BETTER than how I remember it being. Unbelievable. i made it and it’s good! i made a thing that’s good again! thanks! Hi Isa! I was wondering if you had an idea of the weight of the potatoes needed for this recipe. I went shopping for all the stuff to make the chowder and the potatoes at my store really vary in size/weight. Thanks! Should be about a pound. I made this the other night and yum. You did it again! I did make a couple of substitutions. My husband is allergic to cashews so I used sunflower seeds. They were perfect. It wasn’t “fishy” enough for me so I just grabbed my kelp flakes and added some extra. Next time I may get lazy and just use them to save some prep time. Awesome… I did three sheets of nori but that worked for me,… Awesome. Just made this last night – a revelation! How you come up with so many perfect recipes is beyond me every single one is better than the last (if that’s even possible). Thank you so much! My oh my, Isa! Every time I make something from your recipes it’s just pure bliss. I usually just stand in the kitchen and go like whaaaat, why is she such a perfect cook? Why can’t I ever be this cool? Yum, just yum! I made this last night and it was fantastic. I used only about one sheet of nori.. i probably could have done another half sheet. but overall, great recipe. With my vitamix i didnt need to soak the cashews and the blending took all of 30 seconds. According to my omni bf it was very chowder-like. The shitakes were spot on. Loved the texture. Heated up nicely for lunch today. Thanks for this share-worthy recipe. Love the new cookbook. Cheers. It says to use the vegetable broth it in the cashew cream, then later to add it to the pot? How much vegetable broth total is required? Thanks. Isa, I made this soup a couple of months ago, and have made it several times since then– I probably make it weekly. My family absolutely LOVES it, they cannot get enough of it! (and I’m the only vegan in the house!) It’s simply become “The Soup”. Thank you so much for this wonderful recipe! Awesome, thanks for the feedback! For those who have a nut allergy: try using boiled then drained cauliflower with cornstarch, salt, and milk processed in the blender. It won’t be as creamy or thick but it will achieve the same effect (got the idea from one of isa’s recipes the pesto soup). I used mostly the cauliflower with a very small handful of cashews to lower the fat content and it worked wonderfully. Love your videos! Very Fun! the name of your cook-top & oven. They look pretty durable. Thanks so much! I am so excited to try this! I never thought to be able to make a vegan clam chowder…I love the stuff but the dairy is not so great with me! Cashews are such a godsend…I use them in a lot of sauces (basil/ lemon -Cilantro/lime) but didn’t think to use them as a cream soup base. Will definitely have to try this as soon as it actually gets cold here in SoCal! And after learning about the insane health benefits of shiitake mushrooms, I highly encourage everyone to at least throw in a few! Your body will thank you! Every once in a while, I jump off the wagon for a good cup of tradtional clam chowder…but never again. This chowder is amazing!!!!! I made this with a friend over winter break (I’m pretty sure he used this recipe) and it was seriously amazing. We changed it only slightly by using oyster mushrooms (a much more chewy, oyster-esque mushroom to me. Also, white button are my least favorite so it worked out well) and didn’t use tomato paste because we forgot to get some. We also ate them in sourdough bread bowls. Clam chowder was one of my favorite soups as a kid and this is exactly what I remembered. I’m a New England girl and grew up with lots of chowdah! I cannot wait to try this! It looks wicked yummy!! Your site rocks! And loved the tunes in your video! I made this recipe out of the cookbook, minus the nori ( I hate anything that tastes sea-ish) and it was one of the best soups (if not THE best) I have ever put in my mouth. I just made this- it was AMAZING! thank you! you helped make my vegan teen daughter’s evening SPECTACULAR! Just made the soup for the 4th time and we totally love it. since i keep kosher i’ve never had the original, but sure enjoyed this version. thanks! I made this low-fat and without the pureed cashews. Just as a simple lovely broth, this was delicious! OMG- this was amazing, It will be in standard stock rotation in my house. This turned out to be a family favorite! so good! I am so making this and the latchkey lime pie today! Two foods that I have missed since I eliminated animal products! this is the best soup i have ever eaten. WOW! I love you. Everything that I have tried has been great. Made this today and it was yum-mazing. Recipes go together super easy and fast. I still marvel at the vegan Challah! OMFreakin’G. Thank you. I made this last night, it was delicious and easy! I think I will try adding some coconut milk next time with some extra cracked pepper and garlic – but overall the recipe is wonderful as is! Thank you! It was amazing how “sea” like it tastes. First off…I think I love you! this soup made made day, clam chowder was always my fave but I haven’t had it since going meat free 20 years ago(vegan for the last 15)! Was wondering if you think rehydrated dried shitakes would work as well as fresh? I used fresh the first time I made it and it was awesome. I want to make it again and I have this gallon sized bag of dried shitakes from my co-op and wanted to try with these. Thanks for all your inspiring recipes and cookbooks! I just made this yesterday.its chilly and raining on the east coast today.I couldn’t wait to get home and heat it up..OMG yummmy..Thanks for the easy recipes ..you’re the best!! This may seem like a silly question but can you use fresh seaweed? I live on the CA coast and have access to fresh. I made it. It was absolutely delicious. I didn’t alter it a bit. wait, I lied. I did alter it. I used arrowroot powder instead of cornstarch, cause that’s what I had. I made this tonight, followed the recipe to a T. Freakin’ hell it was good! Next time I will use some dried shiitakes, which I think are even chewier. Deeeelish! OMG I absolutely LOVE this recipe! I made this last night for my meat-loving family and even they enjoyed it! It’s incredible how similar this tastes to real clam chowder. Thank you so much for this. You are amazing. Your recipes have never failed me. Can I use seitan in place of the mushrooms? Thanks! Yum!! I may be a little late to the party, but at least I got there. Like some others, I’ve never had clam chowder. Not so craving the fishy thing, so I left out the nori and added sautéed leeks and red bell pepper, as well as some picked smoked jalapenos. Oh, my. So delicious and satisfying. Truly spectacular. Thank you!! YUM! Does this freeze well? If not how many servings does it make? THIS WAS SO GOOD! Like, soooo good. I don’t really like clams so I tried your recipe instead. I used a pack of dried shiitakes since they were cheaper. I also found that cutting rolled up nori with a scissors was way easier than trying to cut it with a knife. My very non-vegan husband and sister also loved this recipe. I was happy to see how creamy it was without actually using any cream. Thumbs up from my med student perspective- this is totally low cal and heart healthy. Will definitely make again. can you use Silk cashew milk instead of using cashews? i’m wonderin if its possible to thicken the milk to a cream like texture for this recipe?? My family loved this soup! The cashew cream just made it so nice and smooth. Great on a cold night. Fantastic soup! I added two tablespoons of cooking sherry and it added a nice dimension to it. Thanks for a great recipe! I was wondering if anyone has substituted sweet potatoes for potatoes in this recipe? I followed every part of the recipe except that I left out the added oil, and OMG, this is sooooooooooo good. The hubs and I are eating the leftovers for lunch at this very moment, and I just couldn’t not come by to post how much this is one of our most favorite vegan meals, ever. I can’t wait to throw this in my omni-loves-clam-chowder sister’s pie hole next time she visits. She’s gonna love the crap out of it! I made this tonight! It was so good and I made it in my ” Give and Let Live” shirt so I felt extra vegan lol. Anyway, I made this with roasted seaweed and it was so much easier to crumble. No cutting needed! Thanks for this beautiful recipe, Isa! Isa, you’ve done it again! This recipe has 2 of my favorite ingredients, mushrooms and cashew cream. I made a couple minor changes, I used roasted seaweed sheets (like another fan, Cassidy) and mushroom broth because that’s what I had on hand, and I added chick peas for a little more protein and texture. It was the BOMB! Another one of your recipes to add to our list favorites (including my meat eating husband) along with beet burgers, chana masala, and veggie korma. Keep it coming! This is by far one of my favourite things I’ve ever eaten. It’s hearty and creamy and chewy and everything you could ever want in a chowder. It was one of the first things I made since switching to vegan 3 years ago. Isa Does It is still my most used cookbook.